The emu is the second-largest living flightless bird. 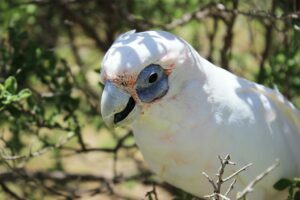 It is a prehistoric bird thought to have roamed the outback of Australia some 80 million years ago. 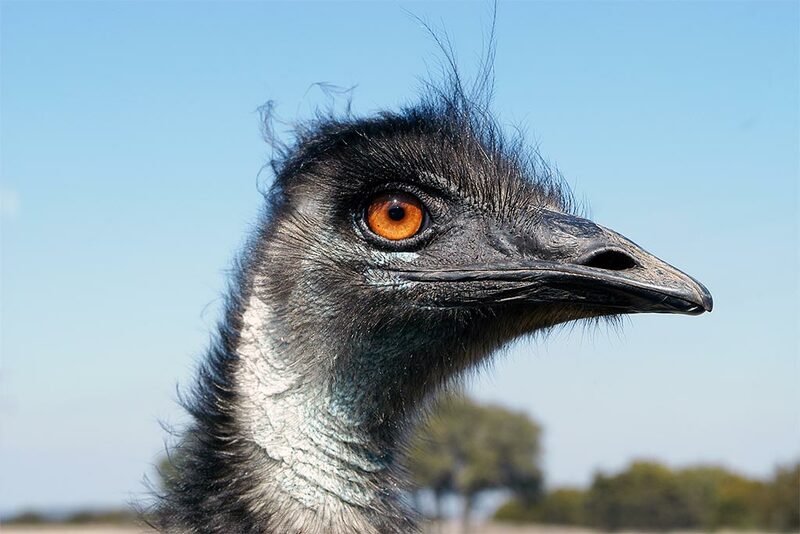 The Aborigines looked upon emu as the core of their existence. Emu provided them with food, clothing, shelter and oil used in the treatment of muscle aches, sore joints, inflammation and swellings. Outlines of emu were chipped into rock faces, and emu movements are mimed in many Aboriginal dances. However, they were heavily hunted by farmers because of damaged crops and the belief they competed with sheep for grass. The Australian government has protected the emu since the 1960s. Emus are monogamous, and their courtship is prolonged. The male lines a shallow depression next to a bush with leaves, grass and bark to make a nest. The female lays 9-12 dark green eggs weighing 1-1.5 pounds each. Then, she defends the nest during the 53-day incubation period, while the male incubates the clutch without drinking and rarely eating. Chicks are cream colored with brown stripes and dark dots on their heads. They leave the nest after 2-3 days. The male teaches the chicks what to eat, how to eat and where to find it. The male guards the chicks for up to 18 months. The feathers have two identical shafts with the barbs so widely spaced that they do not interlock. This gives the emu a “shaggy dog” look. The emu can run up to 30 mph by taking strides of more than nine feet. They defend themselves by kicking and ripping with their extremely powerful feet. When frightened, they make a booming call to warn others that danger is near.